You may now be thinking, “Crossword puzzle? WHAT crossword puzzle?” There are two possible explanations: 1) It’s in the mail and you simply haven’t yet received it; or 2) I have unaccountably failed to send you one. If it’s answer 2, please don’t feel slighted — my level of organization is poor even on the best of days, so I’ve probably mislaid your address, if I ever had it to begin with. So here’s the deal: ANYBODY I know who has made it to this blog and is reading these words is welcome to receive one of these puzzles. Just send me your address and I’ll pop one in the mail. In any case, don’t look at the solution until you’ve given the puzzle a fair shot (you are of course free to disregard my plea and look anyway). Hi Chuck and Happy New Year! 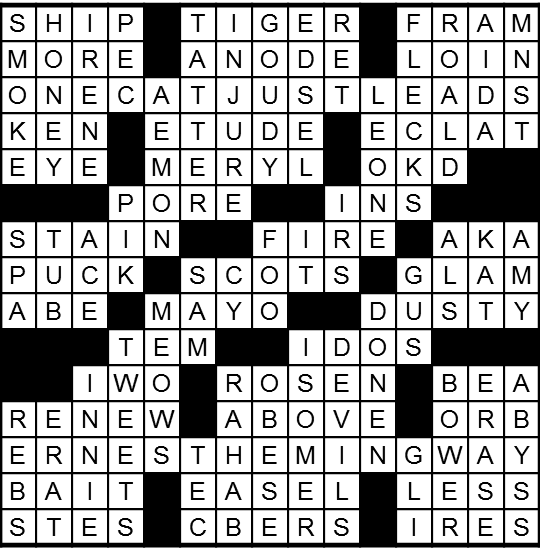 I love the crossword puzzle and guessing all your former and current cats. Mt current cats, Febie & Maia wish I would pay them this much attention. It's nice to hear from you. I am okay, using a cane at this point, and definitely do not go out on days like today! So I have spent this week watching the entire Breaking Bad series. Only 10 episodes left !! I only saw the final episode which piqued my interest. I hope all is well with you (sounds like it from your blog) and have a happy 2014! !